You are here: Home / Would YOU want to sit on THIS guy’s lap? Would YOU want to sit on THIS guy’s lap? This weekend Cortney and I were able to visit with our good friends, Tara and Anton and their baby, Olivia along with Tara’s sister-in-law, Liz and her 2 1/2 year old daughter, Rebecca. We met at Rivertown Crossings Mall for lunch and then went upstairs for Olivia and Rebecca to sit on the Easter Bunny’s lap. Now I remember as a child not loving to sit on Santa’s lap, but at least he was a real man with a real face. 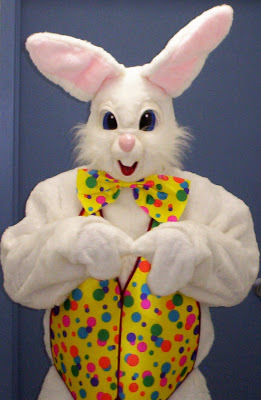 The Easter Bunny is a big creepy fuzzy thing that doesn’t talk. So Cortney and I stood back to watch the procession of children wait anxiously in line just to change their minds when the got a good look at the mad bunny. Tara and Anton didn’t have a problem with Olivia. She is only a few months old, so to her, it was probably like laying on a big, fuzzy blanket. Rebecca however, did NOT love what she saw. She turned right around and tried to go out via the “in” line. I know it’s not funny when you are the parent, but boy was it funny to watch as an outsider! Yesterday, over Easter dinner, I relayed this humorous story to my brother, Chris. Apparently Jack had the same feelings for the Easter Bunny. Chris told me that when Sarah took Jack this year, she had to tell him, “Jack, sit on the Easter Bunny’s lap and tell him what you want for Easter.” Jack quickly replied, “Mommy, YOU sit on the Easter Bunny’s lap and tell him what I want for Easter.” Smart kid. I wouldn’t want to sit on that guy’s lap either!